Today’s entry marks a return for Master’s student Brooke Long. 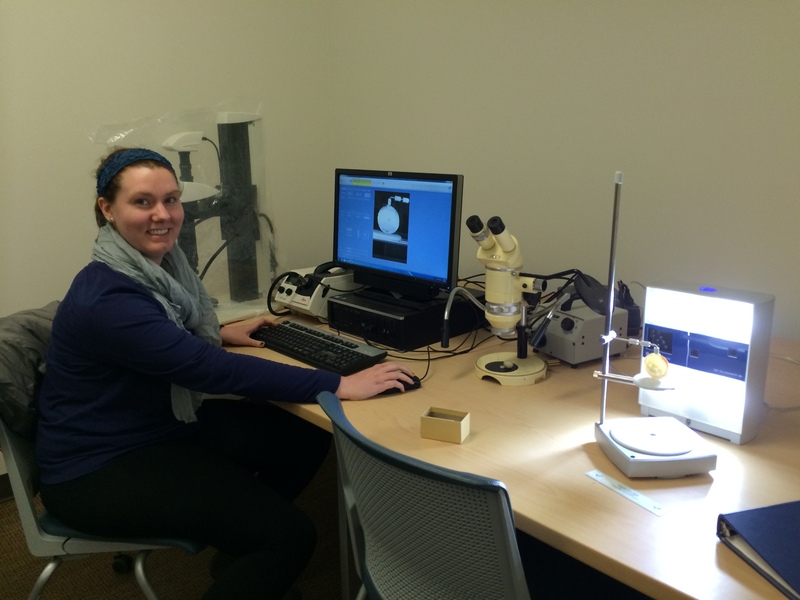 Brooke continues to describe her ongoing research on lucinid bivalves. Brooke describes her investigation of morphometrics, which is any quantitative measurement and analysis of morphologic (physical) traits. Traditional morphometrics involved linear measurements of size, such as length, width, and height. The problem with this approach is that it is exceedingly difficult to directly compare specimens that exhibit large size differences. The standard deviation of the length of a sample four-inch adult bivalves may exceed the maximum length of a single quarter-inch juvenile. Smaller individual measurements become subsumed by larger values and direct comparison of morphology becomes impossible. Geometric morphometrics is the quantitative representation and analysis of morphological shape using geometric coordinates. By analyzing the position of key morphological landmarks, we eliminate the pitfalls associated with differences in size and focus exclusively on shape. This allows for comparison of individuals of vastly different size. As mentioned in my earlier post, the Imaging Lab in the PRL is equipped with a 3D scanner, a flatbed scanner, and a digital microscope. Following Dr. Laurie Anderson’s footsteps, I am interested in studying modern and ancient settings utilizing museum collections and statistical analyses. My current research involves examining the morphology of lucinid bivalves to detect a chemosymbiosis proxy. In order to quantitatively examine the morphology of a specimen, I use a method called geometric morphometrics to analyze the shape. This involves spending a lot of time in the digital imaging lab to collect three-dimensional images of lucinids for analyses. Brooke in digital imaging lab using the NextEngine 3D Laser Scanner HD. The lucinids used for this study are all shallow marine-water taxa from the western Atlantic Ocean, many of which were collected this past summer (Phacoides pectinatus and Stewartia floridana) or are from Dr. Anderson’s fossil and Recent collections. In order to get a large enough study sample, I have chosen to evaluate at least thirty specimens from nine different lucinid taxa. When I am collecting data on each of these lucinid specimens, I obtain 3D images using the surface laser scanner, a NextEngine 3D Laser Scanner HD. 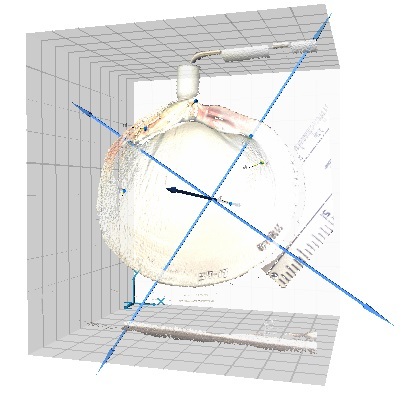 This image is created by placing a single lucinid on a turntable so that it can be scanned to produce a 3D model of the shell. The model is then edited to fill in small holes and remove unnecessary items that were incorporated into the model, such as the turntable. Finally, the model is imported into a digitization program called Landmark where I manually select locations on the shell for landmarks to be placed. These landmarks are placed in the same order and same part of a feature for every specimen. Overall, this means I am scanning at least 270 lucinid specimens at three minutes per scan and five minutes for digitization per specimen. 3D scan of lucinid with landmarks focused on the anterior adductor muscle scar. Taylor and Glover (2006) suggest that the use of morphological characteristics such as shape and position of anterior adductor muscle and the pallial blood vessel can be used to trace symbiosis back to the Silurian. After I’ve collected all of the information I need from the 3D model of each specimen, it is subject to a full Procrustes superimposition to remove non-shape variation of size, position, and orientation. Once this is done, I use a program called R software package (R Core Development Team, 2013) to analyze my data. This is a program that I learned to use while taking Dr. Christina Belanger’s Quantitative Methods in Paleontology class. Geometric morphometric packages, like geomorph (Adams et al. 2014) and morpho (Schlager 2013), are added to the R library to help with this analysis. The final results from the statistical analysis can then be interpreted. Adams, D. C., & Otárola‐Castillo, E. 2013. geomorph: an R package for the collection and analysis of geometric morphometric shape data. Methods in Ecology and Evolution, 4(4):393-399. R Core Team. 2014. R: A language and environment for statistical computing. R Foundation for Statistical Computing, Vienna, Austria. Schlager, S. 2013. Morpho: Calculations and visualizations related to Geometric Morphometrics. R package version 0.23. Taylor, J. D., & Glover, E. A. 2006. Lucinidae (Bivalvia)–the most diverse group of chemosymbiotic molluscs. Zoological Journal of the Linnean Society, 148(3):421-438.